Home > Calvinism	> So, “God so Loved the World” Only Refers to The Elect? So, “God so Loved the World” Only Refers to The Elect? As such, Dr. Lawson contends we need to exercise caution in interpreting John’s use of the word “world”. I’ve been unsuccessful finding out what, according to Dr. Lawson, are the other interpretations for the word “the world” and getting some additional details of this sermon. In any event, I’ve experienced before that what appears to be to be a plain text passage in the Bible is often interpreted quite differently by my Calvinist friends. 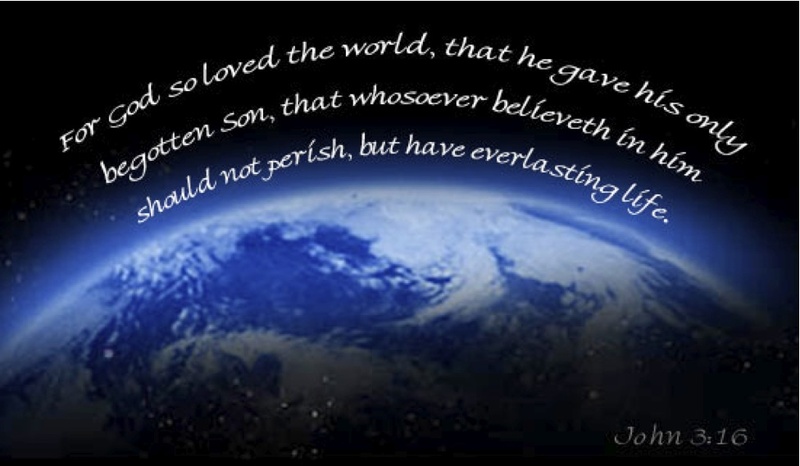 But this is the first time that I’ve come across the word “world” in John 3:16 not referring to all of humanity. To me, John 3:16 (at least in the NIV) is pretty easy to understand: For God so loved the world that he gave is one and only Son, that whoever believes in him shall not perish but have eternal life. It’s certainly a fair point of argument if the word “the world” in the context of the passage implied something other than every person. But I don’t think that is the case here. (16) For God so loved [the elect] that he gave his one and only Son, that [the elect person] believ[ing] in him shall not perish but have eternal life. (17) For God did not send his son [to the elect] to condemn [the elect] but to save [the elect] through him. (18) [Whichever elect person] believes in him is not condemned, but [whichever elect person] does not believe stands condemned already because [that elect person] has not believed in the name of God’s one and only Son. (19) This is the verdict: Light has come [to the elect], but [the non-elect] loved darkness instead of light because [the non-elect’s] deeds were evil. (20) [Everyone who does evil hates the light, and will not come into the light for fear that [their deeds will be exposed. (21) But [whoever] lives by the truth comes into the light, so that it may be seen plainly that what [he] has done has been done through God. For me, verse 18 appears most problematic. Jesus says whoever believes is not condemned and whoever does not believe is condemned. This seems pretty straight-forward to which my Calvinist friends would say that God saves those he wishes to save and to those God wishes to save he gives the ability to believe. However, it’s the same word in the verse- whoever. And there is significant tension when I insert “the elect” for “whoever”. [The elect person who] believes in Jesus is not condemned, but [the elect person who] does not believe stands condemned already because [that elect person] has not believed in the name of God’s one and only Son. According to what I know and understand about Calvinism, there’s no such thing as an elect person not believing. Therefore, in my simplistic reasoning, if one doesn’t accept that “the world” in this passage doesn’t refer to everyone (i.e. all of humanity) there have to be significant linguistic gymnastics to overcome (what I think is) the obvious and plain context of the passage And I have to wonder, whether Dr. Lawson (and all Calvinists for that matter) find it necessary to alter the clear verbiage of scripture in order to more closely follow a system of belief i.e unconditional election? context tells us that Jesus is praying for believers – both those who believed at that time as well as those will come to believe in the future. He says He is NOT praying for the world. logic should tell you that “world” does not refer to “every single person in the world” here – otherwise He would not even be praying for the disciples – but rather “the world of unbelievers.” this is straightforward enough, right? so why would an honest person randomly start inserting “elect” for “whoever” rather than “world” as you state here? your thinking is awfully random here. so Who is it that condemns these unbelievers? if Jesus did not intend to condemn them, is the Father in opposition to the Son? is the Trinity divided? if unbelievers are condemned “already” (most likely not in a “loving” way), how does that fit with Jesus lack of condemnation in v17? this is the short answer as to why (at least some) calvinists believe that world in John17 means “world of unbelievers” and world in John3 points more to the “world of believers.” Jesus is speaking to believers, with unbelievers as more of a side note. you say that God is reconciled to unbelievers (that’s what “atonement” means), the bible says that God’s wrath abides on them – John3:36.
calvinists naturally affirm that God knows the future perfectly and has had an intimate knowledge of His people from Creation. Heb10:13Since that time he waits for his enemies to be made his footstool, 14because by one sacrifice he has made perfect forever those who are being made holy. we – of course – are not God, so we leave the identities of the “elect” to Him and freely invite all to come and be saved. Rom8:32 He who did not spare his own Son, but gave him up for us all—how will he not also, along with him, graciously give us all things? 33 Who will bring any charge against those whom God has chosen? It is God who justifies. 34 Who then is the one who condemns? No one. Christ Jesus who died—more than that, who was raised to life—is at the right hand of God and is also interceding for us. logically, who is the “us” in this passage? internal evidence says it’s talking about the “chosen” – it’s talking about believers. Jesus said in John17 that He intercedes for us and NOT the world, right? The unbelievers are condemned “already” but Jesus came to save His people (Matt1:21; John3:17), not condemn them. This is all part of why (some) calvinists look at “world” the way we do. no gymnastics needed – the bible interprets itself consistently, if you are willing to let it. John says that “the world did not know Him” (Jn 1:10). know him, not even his own disciples? Jesus take away the sin of every person without exception? person without exception (including themselves) had followed Jesus? person without exception hated them? crucifixion (Jn 16:20), was he predicting that every person without exception would rejoice? known You,” (Jn 17:25), was he claiming that every person without exception didn’t know God? know any Christians to be Christians? person without exception hears them? one more thing – “world/kosmos” is one issue in John3:16.
a somewhat separate issue is that there is no “whoever” in the greek – which may be part of your confusion above. interpreted as originally intended, it’s fine to interpret John3:16 as saying “God sent Jesus so that anyone – (more accurately) “everyone” – who believes will not perish but be saved.” calvinists are agreed that whoever believes will be saved. the problem is that many noncalvinists interpret the english word “whoever/whosoever” to suggest that God doesn’t really know the future and that He’s just running something up the flagpole to see if anyone might maybe salute…which is nonsense. if you look back at our previous exchanges, the word being translated as “whoever” in John3:16 is actually the greek word “pas” (“all” or “all kinds”)…so the greek in v16 points to Jesus as the Savior of “all believers” – or possibly toward the jewish pharisee Nicodemus “all kinds of believers” (whether jew, gentile or samaritan). there is no uncertainty implied in john3:16 in the greek – every believing one will not perish but will be saved – but the english translations can muddy things a little if you are careless (as dave hunt certainly is). Thank-you, Charles. You’ve offered up much for consideration and it’ll take a bit of time to digest and think through your replies. One quick response, though – I didn’t necessarily take issues with Dr. Lawson’s contention that there are various interpretations for the word “world” and your references above confirm that. Context is critical for understanding – to which I’m sure we both agree. More to follow. Be well. after looking again, i think you were just conflating the two separate issues. no big deal but again, even if you disagree at least try to represent the other side accurately. i’ll impose a little more just to add that calvinists like john piper and charles spurgeon both offer relatively traditional interpretations on John 3:16. from what i’ve read at least, neither seems to get too hung up on v18…both suggest that God loves the world so much that He if offers and invites every single person to come. (Even knowing the invitation will be trampled by many, like the lord with the banquet in Luke 14.) And that it’s a simple, temporal offer in our terms to “whosoever will” come and believe. so let’s be clear that most calvinists are fine with the traditional interpretation of John3:16. and even calvinists who think v18 and that v16’s “all believers” = “elect” point to “world” meaning specifically “world of believers/elect” as that is toward whom the benefits of Jesus’ coming are promised are not opposed to the free invitation of the gospel to every person (again, God is God and we are not) – just not so much from this particular text. but while some noncalvinists teach unbelievers that “God loves you and Jesus died for you” and will only warn of “future” condemnation (if any at all), at least balance the teachings of John 3:16 with the warnings from John 3:18 and 36…as long as you teach both, you’re in the bounds of orthodox teaching, calvinist or not. I hope I’m not sounding “huffy” here, but honestly, Charles, in spite of my inherent disagreement with the Calvinist doctrine of unconditional election, I try to accurately represent what I understand Calvinist doctrine to be. Perhaps there’s some ignorance on my part – fine and well – and please feel free to enlighten me. But I hope you don’t think I am intentionally misrepresenting Calvinism in my posts. to jumping over to 2) ” ‘whosoever’ means ‘elect’ ” in v18, which doesn’t logically seem to follow at all. I apologize for the delay in responding, Charles. I’m out of town attending the memorial service for my father (who died a year and a half ago) and my 104 year-old grandmother. I wrote a post about her a while ago. My mother had my father cremated and his ashes have been sitting on the mantle until no. I’ll be back home on Tuesday and will hopefully have something back at your shortly thereafter. As to your question, I didn’t necessarily question just what the meaning of “world” was – pertaining to Dr. Lawson’s radio sermon. And since then, as I’ve further read and looked at the scriptures you provided; yes, the word “world” can have any number of meanings. What I was attempting to do by inserting “elect” into V17 was to show that this verse (logically, at least to me) doesn’t make sense if, as Dr. Lawson contended, this passage – or John 3:16 to be fair and more specific – refers only to the “elect” because, so far as I understand, those elected individuals are not condemned. In any event, I’m not trying to avoid the discussion. I will respond. I appreciate your patience. Eph2:1 As for you, you were dead in your transgressions and sins, 2 in which you used to live when you followed the ways of this world and of the ruler of the kingdom of the air, the spirit who is now at work in those who are disobedient. 3 All of us also lived among them at one time, gratifying the cravings of our sinful nature and following its desires and thoughts. Like the rest, we were by nature objects of wrath. apart from the work of Christ, the elect deserve condemnation, though. by nature, the elect were objects of wrath…following the ways of this world… no different than those who persist in unbelief. no smarter. no more spiritual. no more willing to turn to God. until God “made us alive” as Eph 2:4 puts it. Jesus could have come to condemn every single person – that would have been a just judgment. Yet He came to save some through His death and resurrection. for this subset of “every single person”, the passage still makes sense. for this subset, it doesn’t make much sense. if God knows they will persist in unbelief, then sending Jesus just frustrates them – as in psalm 2, they do not desire His rule as they prefer to do what they want. adding a “whosoever” doesn’t help, as the benefit (“eternal life”) of God’s expansive love in v16 is only for believers one way or the other. (there may be other benefits provided by Jesus life and death, but not so far as John3:16 is concerned). and again: v17 says that Jesus did not come to condemn unbelievers and yet v18 says they are condemned already (God’s wrath remains on them) – I really would like to see your solution for this issue if you find one. Being completely candid, shortly after I returned from the funeral services, in trying to come up with a response, and using my “logic” and word-interchange, I came across the dilemma that you have just put forth and, again to be candid and honest, am not able to fully unpack what the scriptures appear to be saying. That doesn’t mean that I’ve given up as it were. But at this time I don’t really have a rebuttal or reply. I think we can agree that everyone who believes will be saved – whether from God’s electing (as you believe) or from man’s own volition (as I believe). That said, God knows the future and therefore knows who will and who will not believe. And obviously, there are various meanings for the term “the world” – referencing your examples/explanations of John three & seventeen, Dr. Lawson’s comments and also my own common sense in reading and understanding scripture. But, here’s what I’ve been working on (albeit much more slowly than I would like to admit): using a concordance to look up the word “chosen”, it is not obvious to me that each time someone is “chosen” they are guaranteed salvation. Tying in with that, as a father of three, I am terribly conflicted that a loving father would, irrespective of kid’s defiance and behavior, predetermine before their birth who would receive, say, the inheritance. I DO appreciate you and your willingness to engage and regret my lapse in responding. But, I’m obviously not the “sharpest tack in the box” and often it takes me a while to think through and respond. Blessings to you, Charles, and happy (belated) Easter. It’s a John 3:16 Mud Fight! Studying the Torah to Move Beyond my Calvinist Divide?